Thousands of workers went on strike on Friday at a Taiwanese-owned shoe factory in southern Vietnam, demanding better pay and benefits, state-run newspapers reported. Some hurled shrimp paste sauce and splashed pig’s blood on workers who were not participating in the strike at the Pou Chen Group factory in Dong Nai province, the website of the newspaper Nguoi Lao Dong reported (www.nld.com.vn). 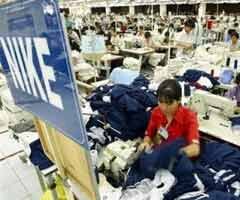 Another newspaper, Tuoi Tre, said the manager of the factory agreed to increase pay by 5 percent but the workers did not immediately return to work, it reported on its website (www.tuoitre.com.vn). It said more than 10,000 workers had walked out. Pou Chen’s website (www.pouchen.com.tw) lists two facilities in Dong Nai, adjacent to Ho Chi Minh City, which it says produce footwear for Nike. Photos on Tuoi Tre’s website showed several hundred people standing outside what appeared to be a factory, although the location was not clear. Workers said the factory provided meals worth only 4,000 dong ($0.21) each, which did not contain enough energy, and they were seeking better meals, Tuoi Tre reported. A state newspaper in January quoted a planning ministry official as saying tough economic conditions this year could lead to more strikes. Strikes have happened periodically in factories in Vietnam because of working conditions, and often involving foreign-invested companies. Thanks to Team Sweat for bringing this story to our attention. This entry was posted in report and tagged Nike, Nike shoe factory, Nike sweatshops, shoe factory, strike, sweatshop conditions, sweatshop workers, Team Sweat, Vietnam, Vietnam newspapers. Bookmark the permalink.